HOUSTON, Texas, Aug. 12, 2011 (SEND2PRESS NEWSWIRE) — Town & Country Leather announces the opening of their second retail leather furniture store in Houston Texas, located in the heart of the Galleria district at 1749 Post Oak Blvd., at the corner of San Felipe in the Post Oak Plaza shopping center, next to other prominent furniture stores such as Meredith O’Donnell and The Arrangement. Their Austin store on Anderson Lane has experienced double digit sales growth each year despite opening in 2008 during the peak of the recession. The new Houston location is slightly different from the Austin store, including a wider range of incredible statement accessories as well as expanding their contemporary leather selection. The family-owned leather furniture specialty store originated in South Florida under the name Falls Leather Gallery and expanded to a 12 store operation spanning 25 years. Owners Eric and Karen Salem strategically relocated to the favorable economy of Central Texas with future plans to include additional suburban locations near existing stores in Austin’s Hill Country Galleria and Houston’s suburb The Woodlands. Both stores feature a large selection of competitively priced modern, traditional and transitional major brand name leather furniture from Natuzzi, Palliser, Bernhardt, Klaussner, Flexsteel, and Artistic Leather. 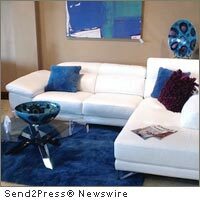 Domicil, a high design German contemporary leather collection, was recently added to the showroom at competitive pricing. They also carry a full line of coordinating tables, rugs, decorative accessories, lighting as well permanent native cactus and succulent arrangements. Original abstract modern art by owner Karen Salem is a unique addition to the stores other one of a kind hand-made items. Advantages of shopping at Town & Country Leather include unsurpassed customer service by knowledgeable leather experts, next day delivery and the ability to special order from leather choices and design configurations. General Manager is Tom Etz formerly with Gage furniture, Houston Store manager Karen Taylor formerly with Noel Design Center. The opening coincides with the launch of their redesigned e-commerce store http://www.TownandCountryLeather.com a leading online leather furniture site.